4th of July in Alaska! I feel like my trip to Alaska was ages ago, but really I just got back two weeks ago today and what a wonderful trip it was. That place feeds my soul, no doubt about it. While I have lots of wonderful things to accomplish between now and then, I am very much looking forward to heading back up there as soon as the weather allows in 2012, and have in fact been hatching plans of all sorts to support that effort. From the moment I stepped off the plane and saw the smiling faces of Devin and Pearlie Girl to the time I stepped back on the plane after hugging the same said Devin and Pearlie Girl goodbye, my time was spent doing all the things I love to do with all the people I love doing them with. What a treat…and it surely didn’t hurt that the weather was just lovely the entire time with hardly a rain drop and lots of sun. Gosh I was glad to be back up there and feel quite lucky to call it home. Here are some of the shots I took during the week. 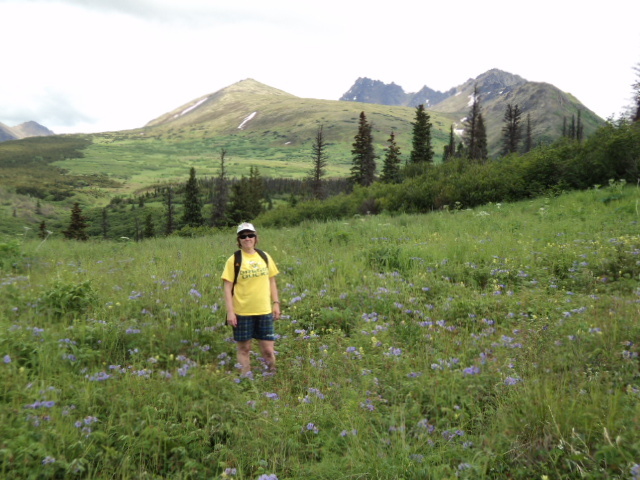 Marilyn and I had a wonderful time hiking the Blueberry Trail before hitting the steam room at the Alaska Club to soothe muscles and to solve the problems of the World, which is what we like to do while steaming. Take a look at our company along the trail. 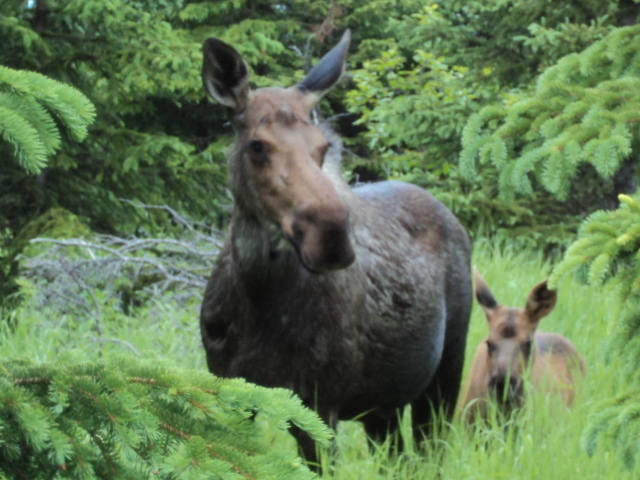 A young Mama and her new baby…maybe 2-3 months old. They were quite close to us and posed nicely until we decided it was time to move on. 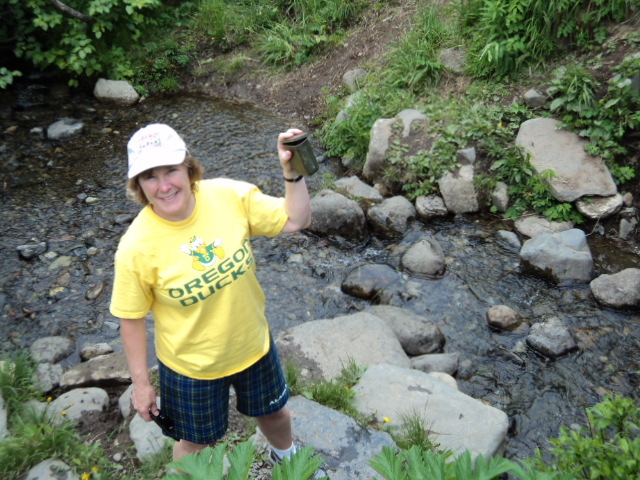 But before we reached the Trailhead, Marilyn hunted up a cache in about a nano second that took Devin and me several trips and many, many, many chunks of minutes to find the previous summer. Go Marilyn! 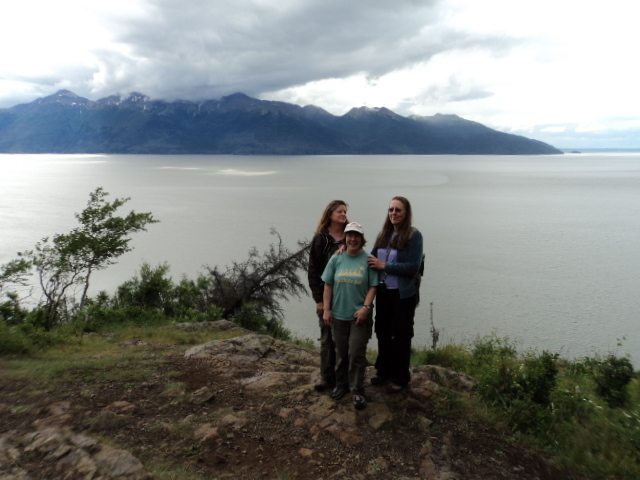 Here’s a shot of Devin, Marilyn, and me on a geocaching hike down the Arm (the Turnagain Arm) one afternoon. 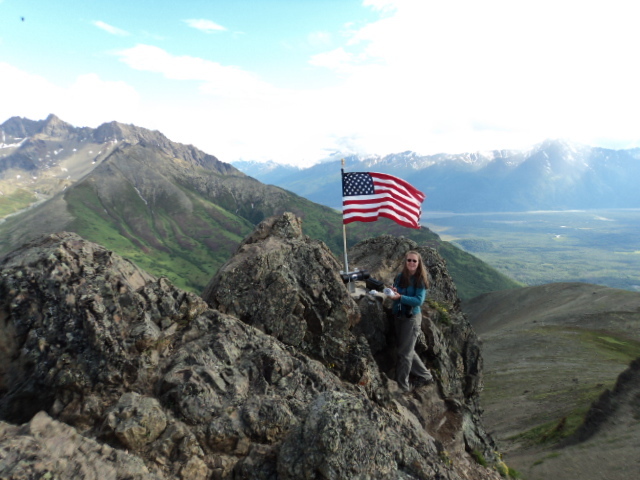 And here’s a shot of Devin on the Summit of Lazy Mountain out in the Matanuska Valley and let me tell you, there is absolutely NOTHING lazy about that mountain. It kicked our butts. We gained an average of 2000 feet of elevation for every mile we hiked and for those of you who know, know that is one STEEP trail. Goodness. Anyway, it was a gorgeous, sunny day and all was wonderful with the world…plus, we each picked up about 10 geocaches for our effort…not to mention the spectacular views….so it was completely worth it. In addition to a geocache and a summit log on the summit, there is also a monument to Wounded Warriors placed there by the Wounded Warrior Project, a non-profit, non-partisan organization whose goal is to bring awareness and support to wounded warriors of this generation. 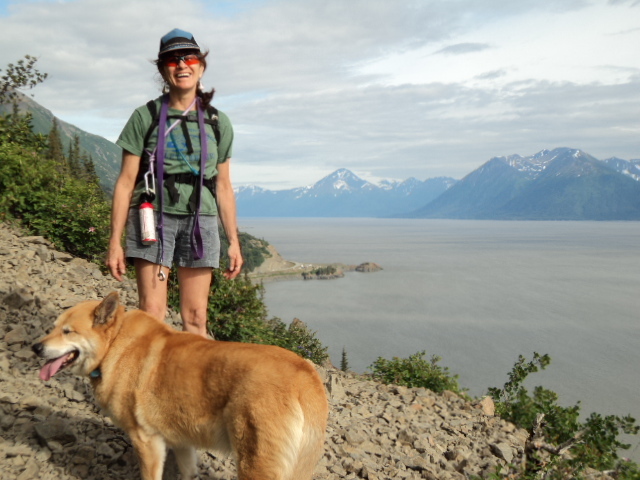 And to end, a shot of my friend and host Carol along with her dog, Sunny once again on the Turnagain Arm Trail, but down the Arm a bit from the earlier hike. Just lovely. So that’s it for the week in Alaska. I did everything I wanted to do and had the best time. I don’t think I stopped smiling and must admit to a bit of internal resistance when it came time to leave, but now that I’m back at school in AZ, all is as it should be. Stay tuned for tales from a day at the river in Sycamore Canyon located in the lovely Verde Valley from whence I just returned. 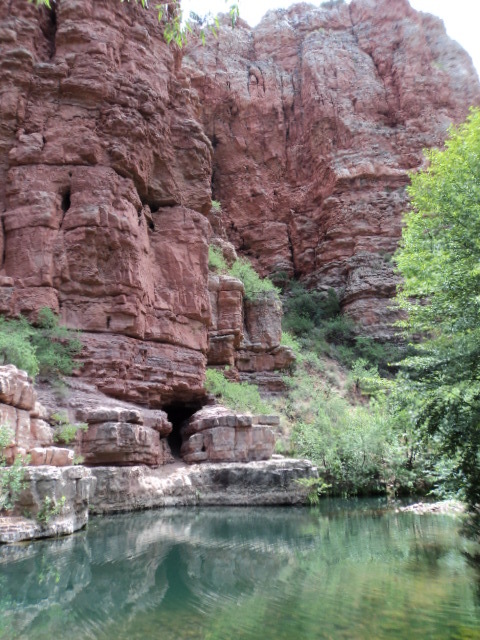 Here’s a teaser…it’s called The Blue Hole and its lovely. ← Long time, no see. Massage School Happenings since last we met. It was wonderful having Margie back in Alaska! I knew we’d be seeing some photos from your Alaska trip sooner or later! Glad you had fun and happy that you shared some of your adventures. Did you attempt to resolve the debt ceiling issue while you were steaming? Seems to remain unresolved. Get back to work! I really enjoyed your visit and am so glad I got to spend time with you. Can’t wait until you return for some more adventures.